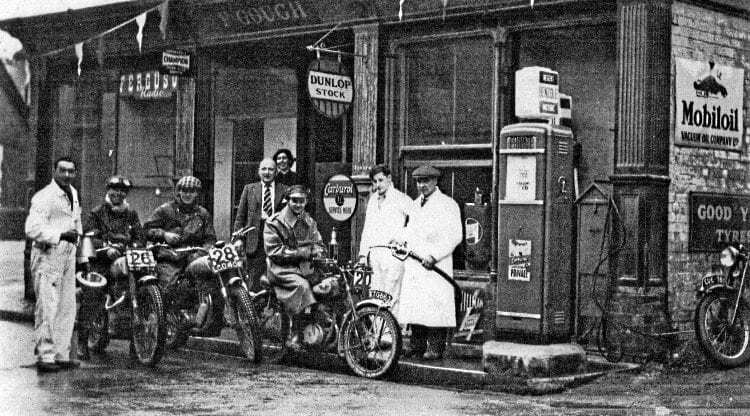 Following Pete’s Prattle (April), here’s an old petrol pump photo that might interest readers as riders in the Welsh Two-Day Trial fill up over the pavement at Gough’s Garage in Presteigne, Radnorshire, around 1950. What an evocative picture of times gone by as riders in the Welsh Two-Day Trial line up to get their tanks replenished in still-austere postwar times. On the left, in white overalls, is Frank Gough, and the man in the striped tie is the Regent rep. The two others in white overalls are Martin Haynes and Bill Weaver. Perhaps one of your readers can identify the riders – and note the Triumph 3T parked by the wall on the right. Read more Letters, Opinion, News and Features in the May 2018 issue of OBM – on sale now! Previous Post:A passion for the unattainable?